I found this beautiful gold and brown Sengaku Kutani plate on a recent treasure hunt looking for Asian art and antiques. When I initially saw it laying on the floor of the shop, I was about to pass by it, because it didn't look like Japanese porcelain to me, at least not anything currently in my collection or anything I'm familiar with or have seen, nevermind even look antique, but modern, as it is, but as my habit is, I picked it up to see what the mark said on the bottom, and that's when I saw the mark and said to my self "ooh.. it's Kutani". 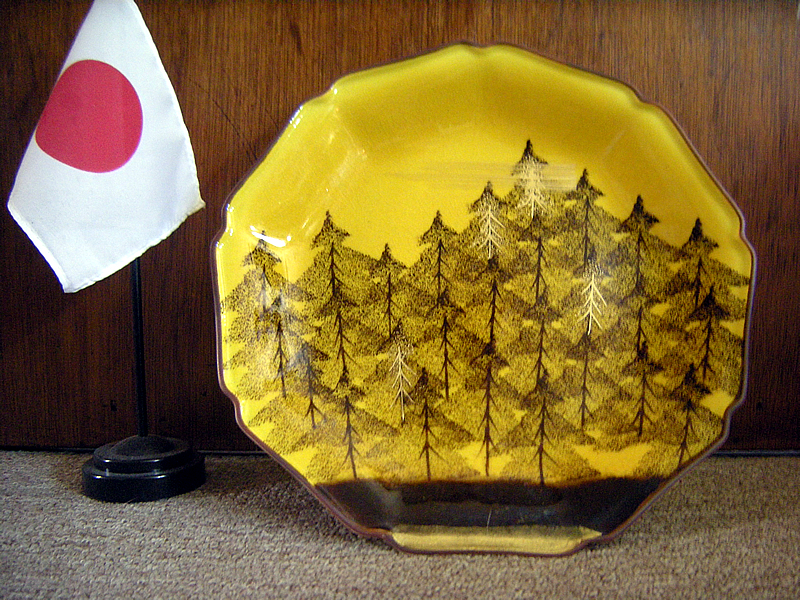 The plate is a golden yellow, with brown pine trees, and some gold leaf details and is marked 九谷泉岳, Kutani Sengaku. When I got home I had to refer to kanji charts and after flipping through page after page, looking through at least 1000+ different kanji, I was able to translate the name Sengaku 泉岳, although I immediately recognized the characters for Kutani 九谷, and knew the character for ku & ga 岳, I had to look up the remaining character 泉, which took some time, & I am pleased with my efforts to translate the signature as that of Sengaku. 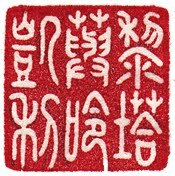 The mark reads 九谷泉岳, Kutani Sengaku..
As of this posting, I have yet to find out any information on Sengaku, the artist who made this, other than he was born in 1933 and specializes in polychromes. 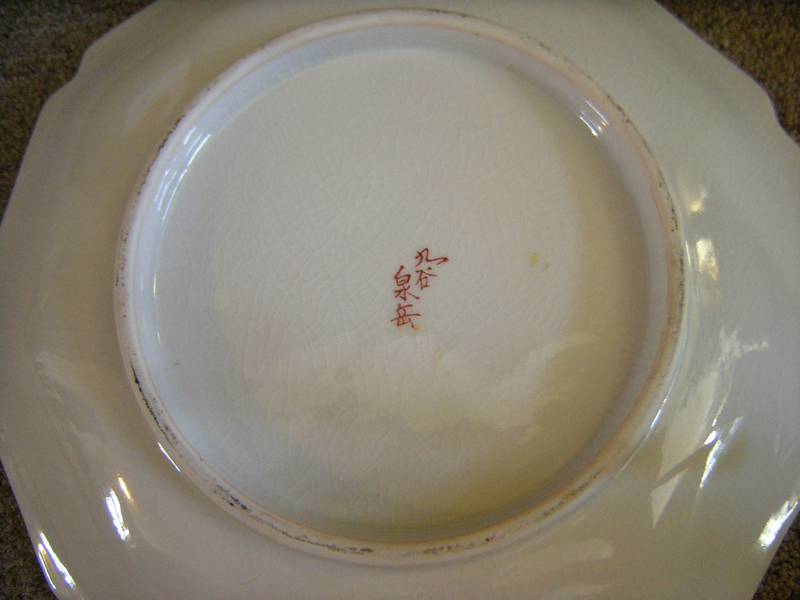 Assuming it's the same Sengaku who makes Kutani porcelain under the name Nakamura Sengaku. Unfortunately the search results for Kutani Sengaku are flooded with spammy results from a particular shady scammer on eBay that is fraudulently claiming a particular Sengaku piece as a Meiji period antique, which is a load of fabricated BS because Sengaku wasn't even alive then, and didn't start making ceramics until probably the 1950s, probably much later than that, so because of that it's a tedious task of weeding through BS to find information on this Sengaku. If I find additional information on Nakamura Sengaku, I'll update this post accordingly.